October 9 – Premier League West Ham, one of the first English clubs to sign professional esports players, will also be one of the first to host their own esports tournament with online qualifiers open now. 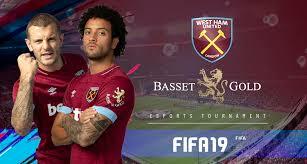 The tournament, launched with the club’s esports partner Basset & Gold (who also have the club’s sleeve patch sponsorship), has a total prize fund of £25,000, with the tournament winner taking £10,000. The final will be played at the London Stadium next month. Operated by online esports specialists Battlefy, on-line qualifiers start later this month and anyone can enter and the club expects to see the best gamers from across the country enter. 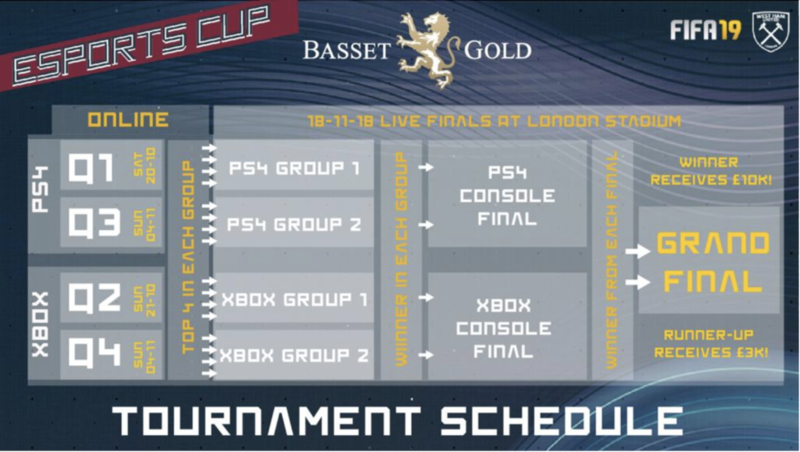 Gamers will compete for the Basset & Gold eSports Cup and play FIFA 19 on PS4 and Xbox with 16 (eight on each platform) making it through to the London Stadium finals on November 18. West Ham’s commercial and digital director Karim Virani said: “West Ham United were the first Premier League team to move into eSports a few years ago and it continues to be an important part of our strategy moving forward. As part of that strategy we’re hugely excited to join forces with our Official eSports Partner Basset & Gold in this search for the UK’s best FIFA19 player.